If you’ve been “convicted” of a Felony offense in the State of Florida, you’ve lost certain important rights (known as “civil rights”) such as the right to vote, the right to serve on a jury and the right to possess, use and/or own a firearm. Furthermore, a convicted Felon may be ineligible for certain professional and occupational licenses. Please remember that a “withhold of adjudication” is not a conviction and will not cause you to lose your civil rights. The loss of your civil rights can have a devastating effect on your life. You may encounter problems getting the type of job you want, or getting a loan or financial aid, or even living in an apartment complex of your choice. Effective April, 2007, Florida law provides for “automatic restoration of civil rights” by the Florida Parole Commission, without the need for a hearing, in most circumstances. Governor Charlie Crist pushed the Executive Clemency Board (which is comprised of the Governor, the Attorney General, the Chief Financial Officer and the Commissioner of Agriculture) to give voting rights back to convicted felons once they've completed their sentences, paid any outstanding restitution to any victim(s), and avoided any new arrests. To see if your civil rights have already been restored, to search and print your certificate or to request that your civil rights be restored, you can visit the Florida Parole Commission’s Office of Executive Clemency website. If you are granted Clemency by the Executive Clemency Board, your civil rights will be restored. You will receive a certificate that will serve as tangible proof that you have been awarded a restoration of your civil rights. In addition, a letter from the Coordinator of the Executive Clemency Board will be issued to serve as further evidence of your restoration of civil rights. It is important to remember that the current procedure for automatic restoration of civil rights does not include the right to own, use, or possess a firearm. However, the Executive Clemency Board will consider applications for restoration of these additional rights. The Executive Clemency Board meets at least four (4) times a year, in the months of March, June, September, and December. The Governor, however, may decide to set additional meetings of the Executive Clemency Board to consider pending applications. Applying to have your civil rights restored, especially the additional/specific authority to own, use, or possess a firearm, can be a time-consuming and complicated process. Many times, an attorney who is experienced in this area of the law can make sure that your Application is prepared correctly, professionally and in a way that clearly specifies your eligibility. In prior cases, the Lawyers of Blake & Dorsten, P.A. have not only helped clients complete their Application, but we’ve also assisted them in making a “packet” or “presentation” to submit with their Application. This can include letters of commendation, character letters, school records, medical records, or any other information that would be helpful in explaining your current situation. If you are interested in discussing the restoration of your civil rights, or have specific questions about your eligibility for this type of relief, please contact Blake & Dorsten, P.A. to set up a free consultation. Contact Blake & Dorsten, P.A. 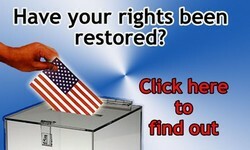 today for further information about Restoring Your Civil Rights.